Julie and I have a crazy busy week cooking for clients, which we love. It just may not give us as much time as we would like for posting recipes on the blog. However, since this is the week right before the Super Bow,l we definitely wanted to get you a few recipes for any party you might be hosting or attending. Today we have a Chili recipe for you, and then the rest of the week we’ll post some appetizer recipes. That’s the plan anyway! I LOVE a good bowl of Chili on a cold winter evening, which we haven’t had many of this winter in Kansas. My husband Dan makes a great bowl of Chili. He basically puts the same ingredients in the pot every time, and it always seems to taste a little different. We also like a pretty thick bowl of Chili around our house. You can always add some extra tomato sauce or juice if you don’t want your Chili to be so thick. I don’t make a lot of Chili because Dan is pretty much the designated Chili Chef around here. Of course, the “foodie” in me is always dreaming of how I can take a basic recipe and give it a little twist by experimenting with different flavors. I know that the ingredient list is long and I’m sorry, but the flavor has a great depth and I think you’ll like it. 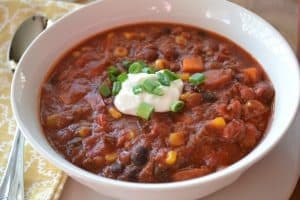 I hope you’ll give this “dressed up” Chili a try! 1 (14 ounce) package Andouille style sausage, cut in half and then in ½” slices. In a large skillet over medium heat, brown the sirloin with the onion. Drain any grease from the skillet. When the beef is just about done add the garlic, red bell pepper, yellow bell pepper, chili powder, cumin, cinnamon, salt and pepper. Continue cooking for about 3 minutes until peppers begin to soften and spices are fragrant. Drain any remaining grease from the beef and transfer the beef mixture into a large Dutch Oven or Stockpot. In the skillet you cooked the beef, over medium heat, add the sliced Andouille sausage and cook for about 5 minutes to brown. When browned, add the sausage to the beef mixture in the Dutch Oven. Pour the bottle of beer in the skillet to deglaze the pan. Make sure to scrape all the dark drippings from the bottom of the skillet. This will add a lot of flavor to your Chili. After deglazing the skillet pour the beer and loosened drippings into the Dutch Oven or stockpot. Add the crushed tomatoes, fire roasted diced tomatoes, diced tomatoes, BBQ sauce, Worcestershire Sauce, Frank’s hot sauce, Chipotle Chili, adobo sauce, diced sweet potatoes, beans and corn to the Dutch Oven. Bring the Chili to a simmer and continue cooking for about 45 minutes for flavors to blend and the sweet potatoes are tender. Season to taste with more salt and pepper if needed. Garnish with Green Onions, Cheddar Cheese and Sour Cream.